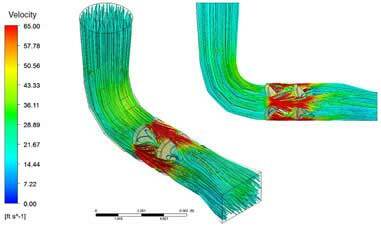 Simulating air and fuel flow inside the modified inlet duct to visualize flow pattern and analyze flow properties distribution. 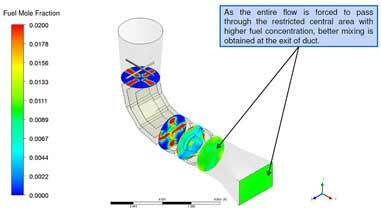 The modified inlet duct design was analyzed for air-fuel mixture uniformity, considering the effects of upstream and downstream baffles. Using realizable k-epsilon turbulence model, the fluid flow behavior was accurately predicted to identify wake regions along the duct length. Using species transport equations, fuel mass and mole fractions were calculated and the results were found satisfactory at the duct outlet. Hi-Tech CAE is is a division of Hi-Tech Outsourcing Services, a pioneer engineering outsourcing company since 1992 based in India & USA. It provides expert Computer Aided Engineering – CAE consulting services for engineering / product design analysis by modeling & simulation.